We are highly specialised auctioneers of Fine Antique Arms & Armour and Important Asian Antiques. The Company, founded by Michael Czerny and associates in 1999, nowadays is one of the most respected and important auction houses in Europe with thousands of lots described, photographed and sold in the last years, and representatives in Germany, Belgium, Russian Federation, Eastern Europe and USA. Based in Sarzana, Italy, since the beginning, Czerny's International Auction House has recently inaugurated the new wing of its premises: a brand new auction room, new offices and a fully equipped photographic studio. Feel free to visit us to estimate your single pieces, or entire collections, from Monday to Friday (from 9.30 to 12.30 and from 14.30 to 17.30) in our premises located in Piazza Vittorio Veneto 13-19 in Sarzana, La Spezia. Otherwise, contact our local agents or drop an email to info@czernys.com. The Italian ancient weapons market capital is Sarzana. That's where collectors gather to attain Italian, but also French, Russian, Japanese and Turkish, masterpieces. Since 1999, Czerny's have been dealing exclusively in edged weapons, firearms, armours, helmets, documents and anything that was used in battles. 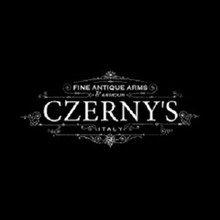 Czerny's are one of a kind in Italy: they are the only auction house exclusively devoted to ancient weapons, i.e. the ones that date before 1890, as defined by the law. Their competitors are Christie's, Sotheby's, and Bonhams. It's a niche business, which, nonetheless, draws a large number of regulars from all over the world. They gather, twice a year, at the Fortezza Firmafede or at the Teatro Civico in Sarzana, where Czerny's, the only auction house specialized in ancient weapons, have their premises. Weapons, romances, shots and quotations. Chisels, inlays and nielloings make pistols, shotguns and sabres real masterpieces, much sought-after for their fineness and the stories of duels and nobility they tell. They are auctioned at Czerny's, in Sarzana. This auction house is a reference point in Europe, and among their clients are Arab princes, royal families and international museums such as the Metropolitan Museum in New York and the Musèe de l'Armèe in Paris. That explains their record sales. A sharp investment. Armours, shotguns and ancient sabres are auctioned at Czerny's auction house in Sarzana. Local or exotic, what matters is that they all have a story to tell. Ancient weapons belong to a varied niche market, which, nonetheless, satisfies collectors' curiosity and passion with good quality works.